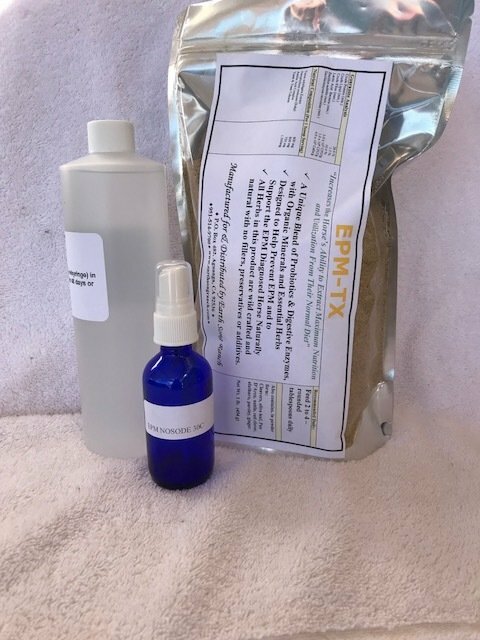 For those of you whose horse is EPM positive, and want a more natural approach to healing, this homeopathic kit will help you to do that at a far lower cost then Marquis. It has been used on 2,500 horses around the country and will heal the horse over a course of 48-60 days. I have used this myself for my horse Destinee to heal her and get her back on the road to recovery. She was very ill by the time we discovered that she had EPM, so it took two treatments to fully cure her. For more information on EPM - Equine Protozoan Myoencephalitis - its symptoms, some preventative measures, and how you might avoid this from happening in your barn or at your ranch, please see our EPM FAQs. "I live in West Virginia and all seven of my horses came down with EPM. When the vet gave us the bad news, in the fall of 2016, well I phoned Jessica and we got them on the EPM kit right away and everyone seemed to resolve at their own pace, some quicker than others and they were all pretty much back to work and riding within just a couple of months. Then I had one that seemed to relapse and we decided to put them all on the Organic Immune Boost. I can tell you they have all been doing great, this has now been a years time, all are symptom free and we could not be happier to know there are natural alternatives for this horrible disease to turn to." "... I purchased a mare, sight un-seen because of her breeding, from a man in Texas, who did not tell me the mare was very ill, she had EPM. When she was delivered I didnt know what to do, she got off trailer and just laid down and would not get up, for several hours. When she did get up with some assistance she walked in tiny circles to the right and had no coordination. I had met Jessica of Earth Song Ranch and knew that her products were something I needed for this mare and that she would know what to do to help her out. We immediately put her on a paste of Equine-Zyme, called Dr. Wessner and then put her on a program of acute homeopathic treatments for 8 weeks, we also put her on a vitamin program including high doses of Vitamins E and C, along with EPM-Zyme to treat the EPM. By the end of the 4 weeks there was major improvement. We had the chiropractor out twice, because from the EPM and her in-coordination she had suffered an injury some time back, before I purchased her. We have kept her on her Equine-Zyme, Colostrum and EPM-Zyme as well as vitamin E and she is doing just fine for her age of 22. Her coat shines, she feels good, and she is now kicking up her heels and has the run of the property. Her name is Ms. Colonel Freckles, her last colt was the high selling colt in Oklahoma, and she is in foal with another premium colt due, bred to Cowboys Desire, due in March 2005. If it wasn't for Earth Song Ranch, Ms. Colonel Freckles would have been put down and would no longer have been here and in continued good health!"